Are you searching for a great nursery that will provide your child everything he or she needs? What Makes Our Early Learning Center Special? 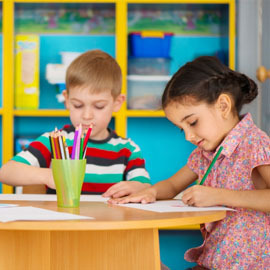 At First Class Child Development Center, our goal is to provide your kids with a positive, home-like atmosphere that stresses nurturing. We know that you want the best for your children, and that’s why our caregivers tailor their care to suit your infant’s specific needs including feeding and sleeping schedules. We’re also proud of the fact that group sizes and ratios of adults to infants is limited so that we can foster one-to-one interaction, ensuring the best possible care for your child. Bibs are provided by First Class Child Development Center. Please label personal items with your child’s name. You are your child’s primary source of security, affection and care. Each child will be matched with a primary caregiver who will help support and work with you. We encourage you to talk daily and share information about your child with our Nursery staff. Our Nursery staff will provide a daily communication to share your infant’s activities and accomplishments during the day. Our caregivers adjust to each infant’s individual feeding and sleeping schedule, not a room schedule. Group size and ratio of adults to infants is limited to allow for one-to-one interaction, intimate knowledge of individual babies, and consistent care-giving. Our caregivers routinely sanitize the changing area after each use, and wash their hands before and after each diaper change. Hands are also washed before and after feeding each infant. Children have their own crib and linens. Toys are disinfected after individual and daily use. These health and safety precautions are taken to limit the spread of germs. Different areas of play are supplied to children daily, both indoors and outdoors (weather permitting). Playing on the floor, riding in the stroller, swinging, being rocked, read, sung and talked to are important experiences provided to children in our Nursery. Our caregivers respond quickly to an infant’s cries or calls of distress, recognizing that crying and body movement are his/her way of communicating. We move to meet children’s needs as quickly as possible. 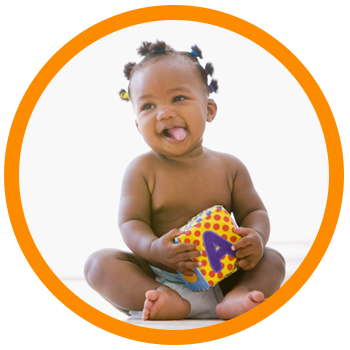 When your child becomes more active (crawling, climbing, sitting) she/he will be provided more challenging activities for busy, mobile babies. We help you when you are ready to introduce finger and table foods, spoons, cups and lids. Eating is considered a sociable, happy time. This age group will also participate in sandbox play, please don’t be surprised if someday we couldn’t get all the sand out of his/her shoes! As your child begins to walk and explore more, his/her environment is adjusted to meet the rapidly changing needs of the walking child. 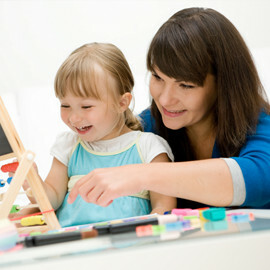 Art media such as large crayons, watercolors, markers and large paper are provided for creative exploration. Sturdy picture books and a variety of manipulatives are available on open shelves so children can make their own selections. Toys can be carried and moved around as children choose, and more than one toy of the same type are available to reduce conflicts. We believe babies should only be in cribs when they are asleep. When the babies are awake, we like for them to be out and interacting with their environment. Supplies you will need to bring: bottles, formula, breast milk, extra clothes, pacifier or anything to help your child feel more comfortable. Bibs are provided by First Class Child Development Center. Please label personal items with your child’s name. 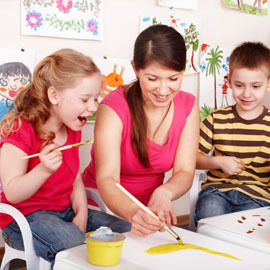 Contact us today to find out how you can enroll your child in the Nursery at First Class Child Development.